As a mother of two children, it seems as though I'm always planning or attending a party with my kids. Whether it is a birthday party, holiday party or a party just because, along with each party comes decorations, invitations and party supplies. I am one of those moms that love invitations that match the theme of the party! It is so much fun creating the perfect party with matching invitations, party games, decorations and or course, cake! Party supplies are what set the mood for any party. From birthday parties, baby showers, bridal showers, holiday parties, graduations, themed celebrations and so much more - decorations get the party started! 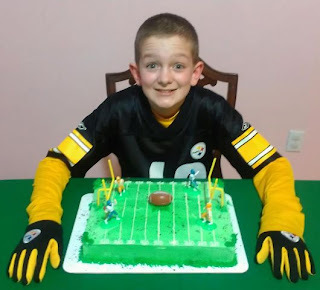 My son recently celebrated his 11th birthday, and his party theme was football! 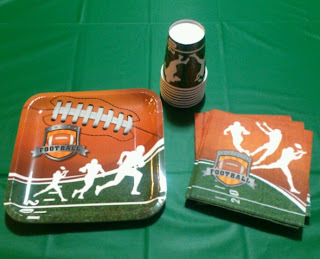 Of course, we had football everything: football decorations and party favors, and a homemade football field cake! I ordered his birthday party supplies from ShindigZ, and had a wonderful experience. Excellent and friendly customer service, quick delivery, and the products were simply amazing! From theme party decorations to theme party supplies, ShindigZ offers unique theme party supplies for mixers, corporate parties, weddings, proms, birthdays, and small gatherings. Everything from decorations, tableware, banners, party favors, and more... even party ideas! No matter what the theme, party or occasion, ShindigZ has it covered! One of Being Frugal and Making It Work’s Readers will win a $50 SindigZ Gift Certificate to spend any way they choose! This giveaway will end May 21st at Midnight EST. Disclaimer: I received one or more of the products mentioned above for free. Regardless, I only recommend products or services I use personally and/or believe will be a good fit for my readers. The views and opinions expressed on this blog are purely my own. Results may vary. No monetary compensation was received. I love the under construction theme! Monster High is the one I'm loving, and my kids would love too. i love the Big 1 Dots - Girl Kit-N-Kaboodle! I like the tinkerbell and fairies kit and caboodle. I think the Ocean Preppy Boy Party is super cute! I like the fighter pilot theme the best. im not sure yet, my nephew's first birthday is comihg up as well as my daughters 15th. so not sure which one i will use it for but sure we get one of them.